Posted April 3, 2015 in Upcoming Kirby. 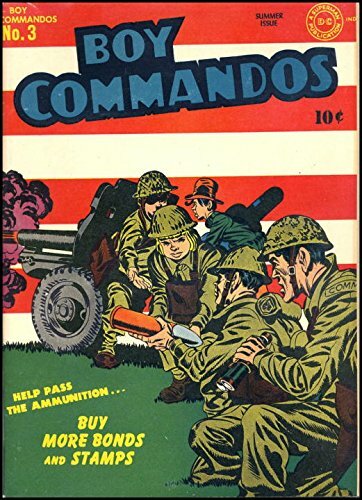 You’d be forgiven if you thought that DC’s reprints of golden age Simon&Kirby comics in their vaults was going to remain incomplete with nothing after the three volumes (SANDMAN, NEWSBOY LEGION and BOY COMMANDOS) published in 2009/2010. Apparently not the case, as DC now has scheduled a second BOY COMMANDOS book in October. Someone appears to have mistakenly titled it as “Vol. 1” in all the available on-line listings, but the contents listing of “stories from Boy Commandos #3-5, World’s Finest Comics #10-13, and Detective Comics #74-83 and 85” make it clear that it picks up where the first book left off. There’s still quite a bit more Kirby left after this, enough for at least a third book, so hopefully they won’t wait another five years to continue. Posted March 7, 2014 in Upcoming Kirby. 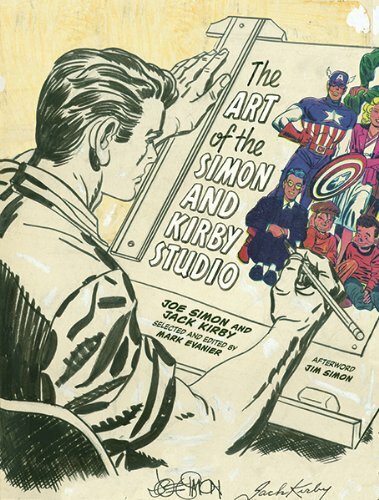 After years of neglect on my part getting sidetracked by other projects, we are finally releasing this Fall The Art of the Simon and Kirby Studio by Mark Evanier and the Joe Simon Estate, featuring 386 pages of original art from their archives at an affordable price and manageable format. I’m not sure if this listing (October release, $60 cover price) is still valid or if it’s from back when the book was first announced over five years ago. More when I know more. Edited to add, apparently that is still a valid listing, and here’s the cover to go with it. Mark Evanier writes about the decision to include one particular Mort Meskin story over here. Posted December 1, 2013 in Upcoming Kirby. Sorry for the lack of posts lately. Just wanted to quickly note a few major Kirby publications set for next year. 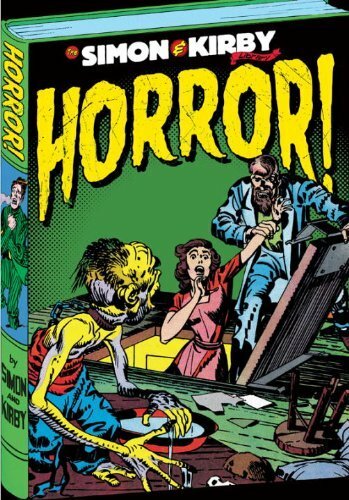 Titan’s S&K LIBRARY series continues next year with the HORROR volume, which should have all the Kirby drawn material from BLACK MAGIC and STRANGE WORLD OF YOUR DREAMS from 1950 to 1954. 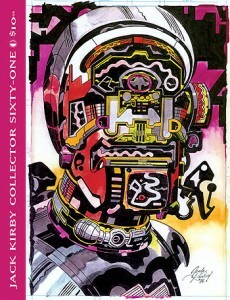 And IDW is publishing an “Artist’s Edition” of Kirby’s NEW GODS. That’ll be a 12″x17″ hardcover reprinting numbers 2, 5, 6, 7, and 8 of the series (the first inked by Vince Colletta, the rest by Mike Royer) as facsimiles of the original artwork. It’ll be especially interesting to see #7, “The Pact”, in this form, since every reprint DC has ever done of it has had several of the sound effects altered from the original printing (apparently for a language that uses upsidedown exclamation marks and doesn’t use the letter “w” much). Anyway, I don’t think mainstream booksellers get these speciality publications, so if you want it you’ll probably have to order it from a comic shop (order code DEC130371) or direct from IDW when they add it to their on-line store. Posted June 6, 2013 in Links, Upcoming Kirby. Jack Kirby’s grandson Jeremy has a current Kickstarter project to fund the publication of THE LIFE AND TIMES OF JACK KIRBY, including lots of photos of Kirby and family and the reproduction of a play Kirby wrote called “The Frog Prince”. Should be impressive looking, considering he’s already at over three times the funding goal with two weeks to go. Check it out, some great photos are on the Kickstarter page, and check out Jeremy Kirby’s Jack Kirby Store for a look at some of the prints and the shirt available for backing the book (or to order them separately if you don’t do Kickstarter). Posted April 8, 2013 in Upcoming Kirby. The next issue of JACK KIRBY COLLECTOR is coming in a few months. Great cover on that, and I’m really looking forward to the look at Gerber’s scripts for DESTROYER DUCK among other things. JACK KIRBY COLLECTOR #61’s theme is JACK KIRBY: WRITER! Whether creating stories while drawing, or pecking away at a typewriter, Kirby gave his work a unique voice which fans either love or hate. Don’t miss this examination of the quirks of Kirby’s conceptualizing and wordsmithing, from the operatic FOURTH WORLD to melodramatic ROMANCE work, and beyond! 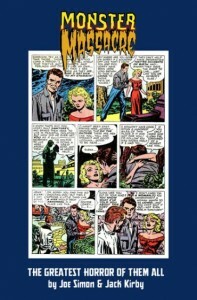 There’s a feature-length Kirby interview, MARK EVANIER and our other regular columnists, NORRIS BURROUGHS on Larry Lieber’s scripting for Jack at Marvel Comics in the 1960s, the late RAY ZONE detailing his 3-D collaborations with Kirby, a comparison of STEVE GERBER’s Destroyer Duck scripts to Jack’s pencils, Kirby’s best promotional blurbs, galleries of pencil art including NEW GODS, DESTROYER DUCK, 2001, and more, plus an unseen Kirby cover painting! Edited by John Morrow. Posted March 26, 2013 in Upcoming Kirby. An upcoming hardcover horror anthology from Titan, MONSTER MASSACRE, will feature the story “The Greatest Horror Of Them All” from BLACK MAGIC #29 [v4n5] . More on the book over here. This story will presumably also be in the S&K Library HORROR volume out a few weeks later from the same publisher, so don’t pick up the book just for that, but it’ll be good to get the S&K work in front of some eyes that wouldn’t normally see it. Posted February 10, 2013 in Upcoming Kirby. The next volume of Titan’s SIMON & KIRBY LIBRARY has shown up on various bookseller sites, scheduled for October 2013. 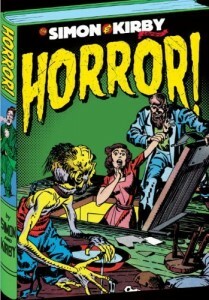 HORROR is set to include stories from BLACK MAGIC and STRANGE WORLD OF YOUR DREAMS published from 1950 to 1954. At 320 pages, it should be enough to include all of Kirby’s artwork from the two titles, so you know what that means: look out for the “Lone Shark”! Posted June 20, 2012 in Upcoming Kirby. Contents subject to change, naturally. Catches many of the strays not already accounted for among other already released or scheduled books from Kirby’s post Golden Age work published by DC (still need a Manhunter and a lot more Boy Commandos and some Newsboy Legion there). I’ll update with a list of what’s missing in a bit. IN THE DAYS OF THE MOB, obviously, but that’ll probably get its own oversized book like SPIRIT WORLD. JUSTICE, INC. is probably out as it’s a licensed character. 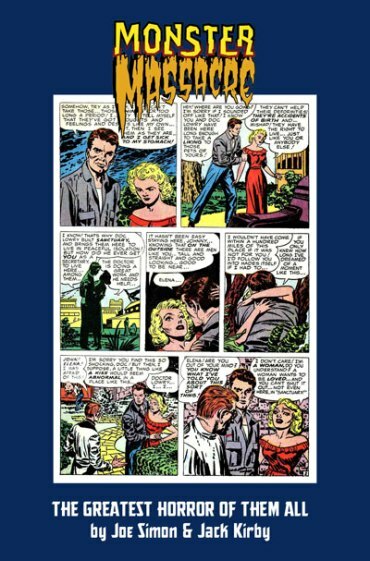 Lots of non-Kirby stuff in the BLACK MAGIC book, and it’s all 1950s reprints which would be better served in Titan’s S&K Library series, which would free up some pages in here to make sure stuff like the unpublished Dingbats stories, the story intended for SANDMAN #7 (printed in the digest THE BEST OF DC #22 ) and all of Kirby’s non-Fourth World WHO’S WHO pages get included. Posted June 18, 2012 in Upcoming Kirby. 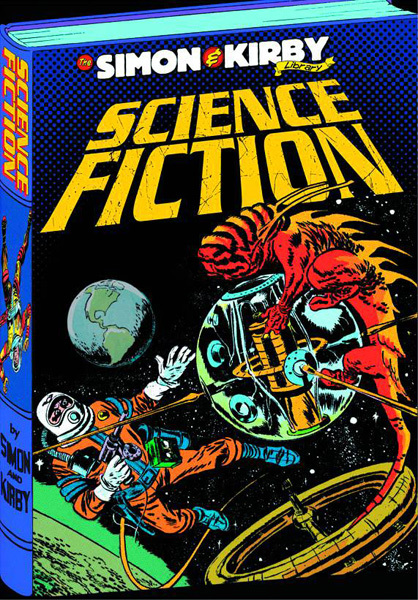 The Simon and Kirby Library: Science Fiction spans more than 20 years, beginning with the first stories Joe Simon and Jack Kirby ever produced together (beginning in June 1940)–their ten-issue run of Blue Bolt adventures. Then the Cold War years will be represented by Race For the Moon, featuring pencils by Kirby and inked artwork by comic book legends Reed Crandall, Angelo Torres, and Al Williamson. Other rarities from both decades are included, and as a bonus for readers, the volume features stories illustrated by Crandall, Torres, and Williamson–without Kirby. Including an introduction by Dave Gibbons, the award-winning co-creator and illustrator of Watchmen, this is an historic volume no comic book aficionado will be able to live without. Posted February 16, 2012 in Upcoming Kirby. • Includes the debuts of the Silver Age FLASH, THE CHALLENGERS OF THE UNKNOWN and ADAM STRANGE!